Origin and Habitat: Coryphantha ramillosa has a wide range in southwest Texas along the Rio Grande in Brewster and southern Terrell counties, and on a substantial portion of northern Mexico on the neighboring Chihuahua and Coahuila. Habitat: Coryphantha ramillosa grows on calcareous soils in xerophyllous scrub and in the desert on bare rocky slopes, talus, or scree and also in Chihuahuan Desert succulent scrub on rocky slopes, ledges, and gravelly flats on Santa Elena or Boquillas limestones. The habitat of Coryphantha ramillosa is home to succulent flora and is particularly rich in local endemics such as: Agave lechuguilla, Euphiorbia antisyphilitica, Fouqueria splendens, Jatropha dioica and Larrea tridentata. It is scarce (estimated population size of 2,500 to 100,000 individuals) and is collected in great quantities by commercial dealers for direct sale from the field, which results in a localized but substantial threat, however, that it is more widespread than originally thought and may not be threatened in most parts of its range. 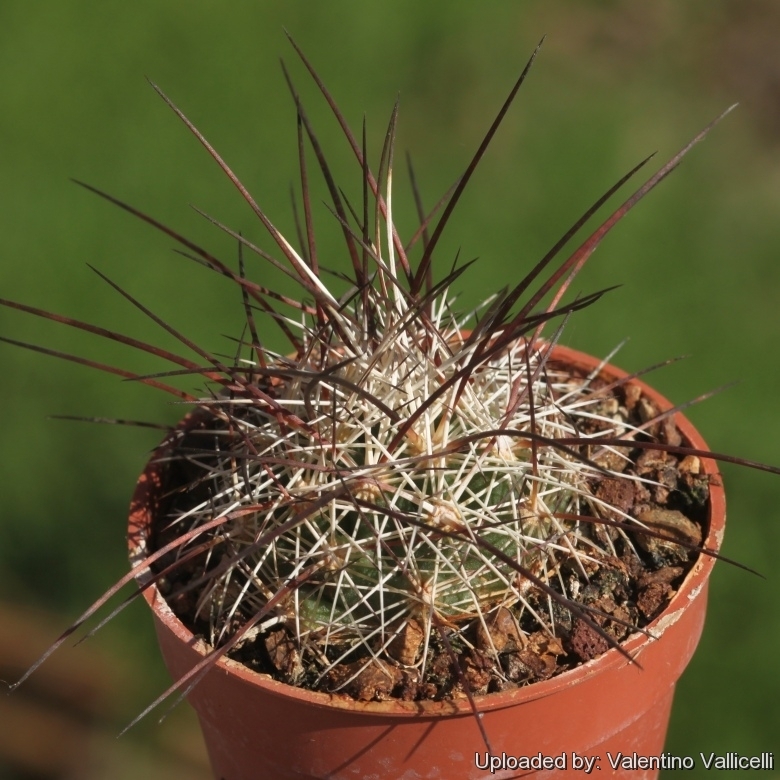 Description: Coryphantha ramillosa is a small cactus species, appearing bristly or shaggy grey, brown, or whitish. Two subspecies are recognized, the typical form and subsp. santarosa Dicht & A.Lüthy. Similar species: It is often difficult to distinguish from Coryphantha macromeris. Habit: It is a perennial stem succulent, predominantly solitary but sometimes branching to form clusters of up to 25 (or more) stems. Roots: Diffuse or strong taproot one-fifth of stem diameter. Stems: Deep-seated, hemispheric or spherical to broadly obovoid, often with flattened tips, grass green to dark grey-green, (1-)6-9 cm high, (3-)6-10 cm in diameter and not mucilaginous. Tubercles: Conical, firm, ascending, 6-20 mm long and 6-9 (or more) mm wide, glands usually absent. Areoles: About 3 mm in diameter at first with white wool, becoming linear and extending for 8-20 mm as grooves to axil of tubercles. Spines: Partially obscuring the stem. Radial spines: (9-)13-16(-20), whitish or glaucous-greyish, sometime black-speckled, usually straight, sometime curving or twisting, often flattened, radiating like spokes (10-)12-30(-35) mm long. Flowers: From young areoles near the apex, funnel shaped, colour varying from pale pink to deep rose purple with darker mid-stripe, glossy, 3.5-6.5 cm long, 3-5 cm in diameter. Outer perianth segments white, entire, upper one-half to one-third pink to purple. Filaments short, white. Anthers pale-yellow to orange. Stile and stigma-lobes white. Blooming Season: It flowers opportunistically from August through November. Flowers open during the morning, close before sunset, and do not open again. Fruits: Obovoid to spherical or elliptic, dark green to pale grey-green, very fleshy, 10-25 mm long and 20-10 mm wide. Floral remnant persistent. Seeds: Yellowish to reddish-brown, glossy, spherical to kidney-shaped, 1-1,5 mm long and 1 mm wide. 1) Heil, K., Terry, M. & Corral-Díaz, R. 2013. Coryphantha ramillosa. In: IUCN 2013. “IUCN Red List of Threatened Species.” Version 2013.2. <www.iucnredlist.org>. Downloaded on 23 January 2014. 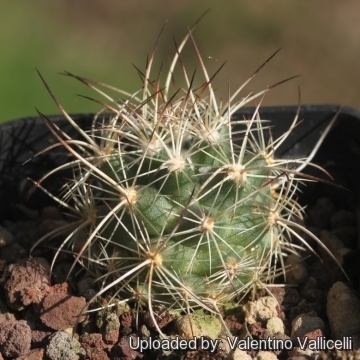 6) Reto F. Dicht, Adrian D. Lüthy "A new conspectus of the genus Coryphantha." In: Cactaceae Systematics Initiatives. Number 11, 2001. Cultivation and Propagation: In culture it is without problems, and regularly shows its large pink-purple flowers.It flowers quite early. Exposition: It does best in light shade, but does well in full sun too. Watering: It is sensitive to overwatering (rot prone). Soils: Needs a very porous soil with good drainage. hardiness: It tolerates fairly low temperatures as long as it is kept dry (hardy to -12° C for short periods of time).